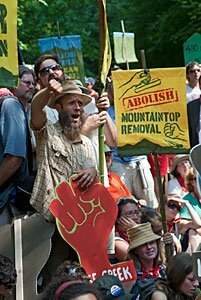 Hundreds of people marched 50 miles through the southern West Virginia coal fields to protest the practice of mountaintop removal, in which the tops of mountains are scraped off and dumped in valleys to get at the coal below. The practice has dramatically reduced the number of jobs in the coal fields while destroying the mountains and polluting the water. The marchers were joined by a thousand more at Blair Mountain, site of a historic 1921 battle between union miners and coal company militia in which more than 100 were killed. Blair Mountain is now threatened with mountaintop removal operations by Arch Coal and Alpha Natural Resources.